hearsoundswrite - A music blog out of South Carolina: Indie Music MAYhem Review 6: "Infinite Arms"
No record defines my college years like Everything All the Time, the debut from Ben Bridwell-lead Band of Horses. Since then, BOH has been a band I hold in high regard. A bit of local bias, sure--Bridwell lives in the Charleston area--but truly, the group has received far more spins from me than, say, My Morning Jacket, to whom they're often compared. Their second album, Cease to Begin, was an excellent sophomore effort even it was a tad ballad-heavy. But it saved them from one-album-wonder purgatory, and earned them steady coverage from this blog. I'm sure they're flattered. Furthermore, it had to be fate that their third album would drop on my 25th birthday--May 18th, 2010. There was no question that they'd feature prominently in our ongoing Indie Music Mayhem series. I fell asleep to the greatest movie of the year." Bridwell has never shied away from including some kind of minutia in his lyrics, but this verse wouldn't sound out of place in a Train song*. C'mon, Ben! Before I continue, I need to mention that this album is absolutely crippled by the band's insistence on rigidly harmonizing just about every vocal track on the album. Sure, bands like the Flying Burrito Brothers did this, but their harmonies bristled with life! These sound downright mechanical at times. It's effective in small doses (again, "Marry Song"), but it totally wears out its welcome within a few tracks. I imagine this decision is due in part to keyboardist Ryan Monroe's band membership. He's been touring with BOH since at least 2007, and deserves credit for aiding the successful expansion of the band's live sound. He harmonizes with Bridwell extremely well on a fundamental level. But perhaps too many of these songs capitalize on that blessing, and the market is oversaturated so-to-speak. BOH utilized harmony brilliantly on Everything All the Time, especially on songs like "I Go to the Barn..." and "St. Augustine", with those delicate, whispered backing vocals that textured the songs so well. I suppose I just wish there was more of that on Infinite Arms. As for the songs: "Compliments" and "Laredo" are both galloping country rockers that are inoffensive but lack the character of, say, "Weed Party" from EATT. "Blue Beard" is a nice summer groove, even if it features some wanky "la-la-la ooohs" and a slightly annoying crash cymbal ride throughout. "Way Back Home", a song that ostensibly deals with Bridwell's return to the East coast after toiling in Seattle, is one of the few songs without the overbearing harmony treatment, so it's no wonder it lands so well. If I had to pin a blue ribbon on Infinite Arms track, it'd probably be the title track itself. A steady ballad that evokes a firefly-dotted summer evening, it flashes a little studio sensibility with its droning bed of synth strings creating a nice sonic environment. It also features a restrained, complementary harmony track (hooray!). The sweeping rise of the lyric, "When my thoughts drift to you" creates a gorgeous moment, especially when it's repeated at the song's end, and the music falls silent, leaving the listener with only the distant chatter of some unmistakably-Carolinian night birds. After the fine-but-forgettable "Dilly", we get to "Evening Kitchen", which I first heard on December 28th, 2009, at the last BOH show I caught. It was presented as a scant and lovely 3 part harmony between Bridwell, Monroe and guitarist Tyler Ramsay. Unfortunately, the harmony breaks down on the chorus a bit, and the song suffers for it. The Monroe-penned "Older" has been a concert staple for years, but I think they totally squandered a chance to put an excellent song to record. Monroe's vocals are simply robotic, the instruments are overly restrained, and the sleepy tempo neuters a song that could have been an upbeat hand-clapper reminscent of "The General Specific" from Cease to Begin. The ensuing "Trudy" is another of my favorites from the album, a slow-burner that's a bit more faithful to the minimalistic approach of Everything All the Time, featuring some well-placed minor chords and a brooding cello throughout. A big part of me wishes the album had ended here; not that "NW Apt." doesn't have its place on the album. I would have lost "Laredo" and slotted this one there. The album closes with "Neighbor", a song that tries for stoic punctuation, but with its references to both chipmunks and Bartles & Jaymes wine coolers, it comes off as a little goofy. 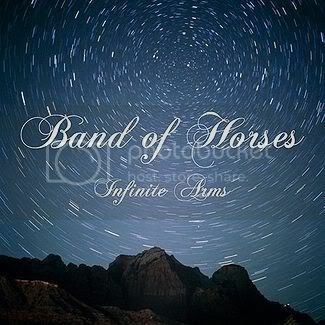 A few things I'll say in closing: I'm being unduly harsh to Band Of Horses because, of all the IMM contenders, they are by far my preferred act. While I may be putting the screws to just about every move they made on Infinite Arms, I'll almost certainly have racked up more listens to this than any other album on my list come year's end. I'll probably soften to the flaws I'm so quick to gripe over today. Nonetheless, my summation is that this is a passable album by a band I truly appreciate. I may not call upon it as frequently as I do Everything All the Time or Cease to Begin, but it'll remain in my greater rotation. And that's more than I could say about a lot of albums. *Thanks to Chris G. for this apt description. On behalf of Columbia Records and Band of Horses, many thanks for plugging "Infinite Arms" on your site (the newly released album by Band of Horses) ... .. thanks, also, on behalf of the artist and labels for not posting any pirate links to unreleased (studio) material and, if you / your readers want good quality, non-pirated, preview tracks, then a full length version of "Factory" is available for fans and bloggers to link to / post / host etc on the band’s site at www.bandofhorses.com ... .. for further details of the new album, pre-orders, on-line promotions, videos and 2010 shows, check-out the official site, as well as the band’s MySpace at www.myspace.com/bandofhorses ... .. and keep an eye on these official sources for details of further news, preview material and on-line promotions. Also and as a goodwill gesture to fans and bloggers, an exclusive widget for the video of “Compliments” is available on the band’s site and an exclusive preview stream of the full album is also now available via stream.bandofhorses.com/ ... .. these are for embedding / hyper-linking ONLY and for streaming by fans directly off the band’s website, so please reciprocate this goodwill gesture by NOT ripping or re-posting these files. After initially disregarding this album, I've just recently taken a liking to it. Just curious if your opinions have changed at all? Honestly man, I haven't. But it's for a lack of trying, I admit. You managed to rekindle my interest in Merriweather Post Pavillion, so I'm going to revisit Infinite Arms this week and maybe the same thing will happen. Glad you're liking it!